I’m fresh out of phrases to introduce this next workbook post with, so let’s just get to it! 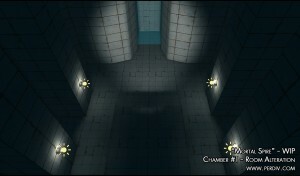 Today’s report: I’ve made a lot of progress already with the second Chamber that I started building today. I did cheat a bit yesterday evening. Since I didn’t have much to do, it being a Sunday and all, I decided to try a little mechanic that I’d have to tinker with either way. I got most of it working and finished, so that enabled me to focus on sketching up ideas for how to present the guidance methods in the new Chamber I started today. I came up with the idea of having interconnected rooms/corridors that look similar, with three doors at the end of each room. Only one of the doors lead onwards to the next room, while the other two just push you back to where you came from, making it a seemingly endless walk if you don’t find the right path. The mechanic itself isn’t all that complex. The most difficult thing about scripting it was making the transition back to the original room as seamless as possible, which I solved by calculating the player’s offset relative to the point where you’re warping from. In simpler terms, if you went through a ‘wrong’ corridor hugging the right wall, you’d end up back in the first corridor still hugging the right wall. It was really neat to see in action and it did turn out very seamless in the end! Other than scripting that, I also built the rooms for where this mechanic would be employed. It was a bit finicky getting the warp triggers to line up right and getting the lights to look the same across the corridors. Nothing impossible though! To wrap things up, here’s a couple of screenshots I just snapped from both Chambers. Who doesn’t like themselves some visuals amongst all these letters? That’s all for now. 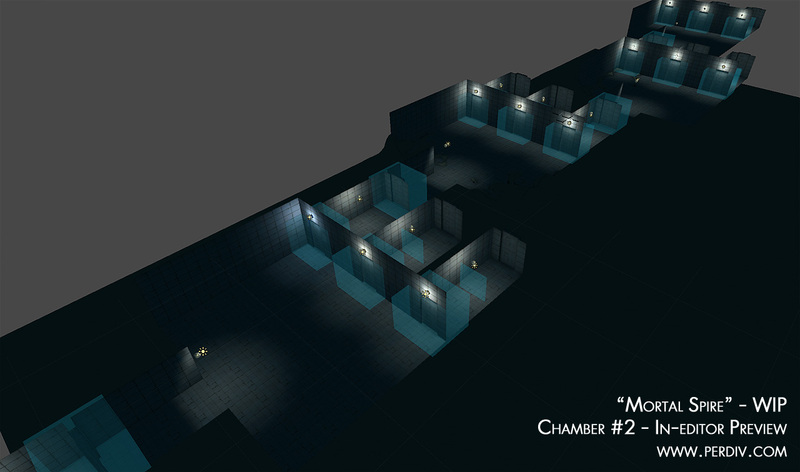 Tune in next time for more level design shenanigans!